I also remembered that, from the beginning of my career, my mother’s side of the family has been very supportive of me. In addition to my mother Orencia, my grandmother Tomasa and my aunt Noni have been like my two other mothers, taking care of me from the time I moved into their house in Madrid until the time I got married. With all of that in mind, I knew I wanted to commemorate my maternal family name, which often takes a backseat to my paternal name. That being said, with this album I would like to pay tribute to my wife, my mother and my family. This is not only a homage but is above all a moving memory of my childhood, a wink and a nod at two men who were born in the same year. I have always identified with their way of playing and making music, never forgetting that I am just a humble admirer of two people whose craft I share. Curiously, we also share the same sign of the Zodiac, Pisces, the sign of artists and musicians. Maybe dreamers, discrete, aware of the difficulties of this noble art of grey storm clouds and white hopes. Great musicians who had to emigrate with few belongings but with a guitar full of talent, soul and magical sounds to show the world, and with the legacy of their homeland as a flag. This album includes an unpublished piece by Esteban de Sanlúcar, “Capricho Flamenco”, which was never recorded even by the author himself. With: Enrique Morente, Antonio Serrano, Pedro Esparza, Basilio Villalta, J.R. Abella, Valentín Iturat, Sonia Cortes. CD 1: Herrero presents his newest works in the company of chosen musicians who accompany him in this project. CD 2: Here Herrero presents these same works accompanied only by his guitar. A genuine homage to the most demanding of palates that sometimes long to taste and to enjoy solo guitar. With: Tino Di Geraldo, Guillermo McGill, Brujas Perdomo, Xosé Manuel Budiño, Antonio Ramos, Ana María Navarrete, Mariví Navarrete, El Bolita y El Patino. The flamenco guitar uncovered, filled with maturity and originality. Specially recommended for fans of this instrument. 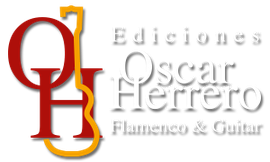 Oscar Herrero, flamenco guitar and Carlos Oramas, classical guitar interpret Manuel de Falla, as a tribute on his 50th anniversary of his death. In our faithful and personal tribute to Falla we want to pay homage to he who, in all his wisdom, wanted to capture the freshness of flamenco and make it compatible with all the subtleties of classical music. In the wake of his legacy one finds true examples of this fusion which underlies much of his work, and here we have attempted to evoke that with our own personal stamp. It makes us proud to think that Falla adopted the personality and sound of the guitar and included it in his pieces, often evoking its harmonies and rasgueos, imitating it in his scores and probing the depths of Andalusian folklore. So, along with this work I present my utmost gratitude to he who, in an intellectual and learned manner, brought together two disparate worlds, dignified flamenco and enriched classical music, and created a universal language for Spanish music, thereby ensuring his place among the greats. With: Carmen Linares, Víctor Monge "Serranito", Gabriel Moreno, Tito Duarte, David Tavares, Javier Barón, Sara Baras, Alejandro Vaquerizo, Ramón Porrina y Joaquín Asumendi. With: Roberto Vozmediano, Antonio Canales, Rafael Peral, Pedro Obregón, Roberto Lorente, Víctor Guadiana, Pedro Medina, Juan Debel, Sandra Carrasco, Pepe Prat, Rodrigo "El Niño", Yago Salorio, Julián Olivares, Rubén García, Enrique Rodríguez, Cuco Pérez, Oscar Herrero, Jesús Bachiller "Bachy", Eva Durán. In his debut album José Almarcha winks at his homeland, from where all his compositions draw inspiration, and to which he owes both his personal growth and his outstanding artistic foundations.